Brokk robots spearhead Poland’s largest current infrastructure project. 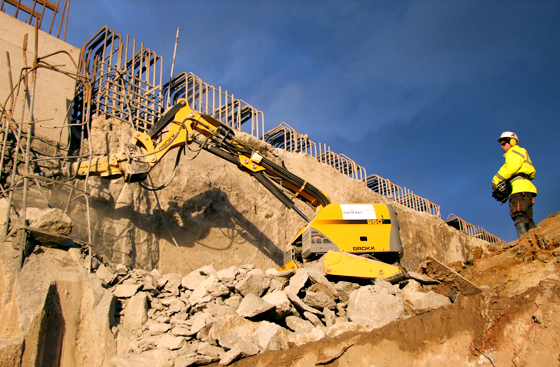 Two Brokk machines are playing an important role in Poland’s largest current infrastructure project. A new transport junction and the rebuilding of the surrounding neighbourhood will by 2015 result in a complete transformation of the Lodz’ city centre. “We have two Brokk machines stationed at the old railway station Lodz Fabryczna that now is being rebuilt. They are working very efficiently and are so much stronger than you expect,” says Konrad Klimkowski, president of Konkret, a Polish company that relies heavily on Brokk. 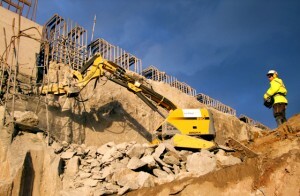 Klimkowski reports that Brokk remote demolition is a core method in the company’s offering. The firm was established in 2006 and already in 2007 the first Brokk investment was made. Today the fleet consists of one Brokk 100, one Brokk 160 and two Brokk 260, breakers, drum cutters and concrete crushers. At the scene in Lodz the two largest machines are used, the Brokk 260 is tearing down concrete foundations, concrete diaphragm walls and the Brokk 160, equipped with a bucket, is utilized for removing the scrabble. Today the Warsaw based Konkret employs some 50 people working with different demolition techniques, often with Brokk technology as a base. “We are now looking into the investment of new attachments to further improve the efficiency in some areas and also to be able to offer new and cost effective demolition methods”, says Konrad Klimkowski. Back to the gigantic Lodz project: over 90 ha of city ground will be totally reconstructed. The total investment of about € 500 million includes new station for the railway and the underground, special zones for art and culture and the Streets of Four Cultures*. Both public and private investors are involved. Lodz, situated in Central Poland, is a vital transport hub connected to cities like Warsaw and Berlin. Posted: May 9th, 2014 under General.